Dawn: Christmas Dinner! Don’t you just love it!?! Andrew: Absolutely! The most important meal of the year, isn’t it Dawn? Andrew: What a shame that is. However, I believe that there is too much panic about Christmas Dinner. 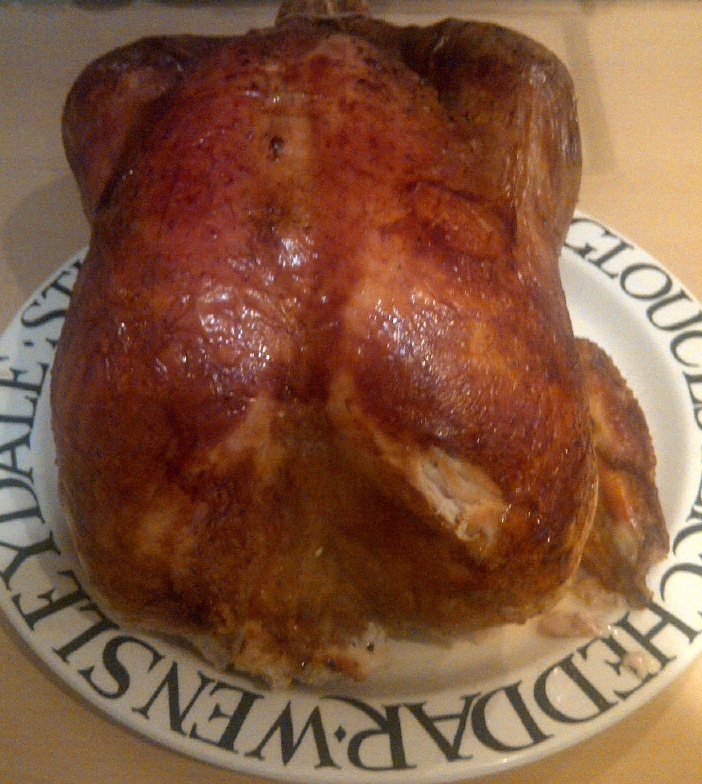 Turkey is delicious, low in fat, wonderful in flavour and equally tasty hot or cold. Dawn: Do you prefer fresh or frozen, Andrew? Andrew: I do prefer fresh. I go to the same butcher each year. He buys the entire stock from a farm in Norfolk, and has done since 1972! I know that my turkey this year has been organically fed and running around happily until a couple of weeks ago. I do know that some people will buy a frozen one. My parents do. Frozen turkeys can be just as tasty and flavoursome as a fresh one. It’s just a matter of following a few simple steps and having a bit of patience. Dawn: Sage advice! If you have a frozen turkey, you must defrost it thoroughly for at least 24 hours before you cook it. You must make sure you have no ice crystals left at all, otherwise you are asking for a dose of food poisoning. Andrew: And equally, don’t keep a turkey, fresh or defrosted, in a warm environment before it is cooked. It’s best to place it in a shed, or an unheated room before cooking. Dawn: Away from prowling felines! There are a lot of suggestions about turkey. What do you think? Andrew: There are suggestions you should soak it in brine, in cola, in water. I have done this for years, and it has never let me down. Preheat the oven to gas mark 7/220º C.
Arrange two large sheets of foil in a roasting pan. One lengthways, the other widthways. Ensure these are long enough to make a ‘tent’ over the turkey. Rub the butter generously into the turkey, paying particular attention to the legs and thighs. It seems very fatty, but this is essential to stop the turkey drying out. Lay overlapping layers of streaky bacon over the turkey breast and season with salt and pepper. If you wish, for extra flavour, place a red onion, or a clementine, or an orange, possible studded with cloves, into the body cavity. I never stuff the cavity – it adds to the cooking time. Fold the foil over the bird, allowing an air space around the bird. Place the turkey in the oven and cook on this high temperature for 40 minutes. After this time, turn the oven down to gas mark 3/170°C electric. Dawn: And now I can relax, can I? Andrew: Indeed you can! Aside from preparing your vegetables, but we cover that elsewhere! Dawn: For this weight of turkey, wait about 3 and a half hours more. Remove the turkey from oven, and turn the heat up to gas mark 6/200ºC electric. Fold back the foil from the top of the turkey, take off the bacon slices, and start to baste the turkey, with a long handled spoon or turkey baster. Place the bacon on an ovenproof plate or dish, returning it back to the oven placing it in the bottom. It will crisp up and is delicious as ‘bacon bits’ with the finished dish. Return the turkey to the oven and continue to baste it with the juices over the next half hour or so. Remove the turkey from the oven. Test the juices! Skewer the breast, thighs and lower body. This is ABSOLUTELY essential. The juices should run clear. For each 1lb/500g greater or less than the amount in this recipe, add/subtract 15-20 minutes to the cooking time. If the juices are not clear, return the turkey to the oven. Dawn: Test to see if the juices are clear by sticking a fork into a plump thigh of the turkey and this with ensure the juices run easily from the bird. If they are clear, pop the turkey back into the oven until they are. When the turkey is fully cooked, remove from the oven, fold the double foil layers over the top, and leave to sit under the foil to settle for 45-60 minutes. Dawn: This allows the turkey meat to set and solidify. It is much easier to carve at this point. Andrew: Carving! Now there is a trick! I have a couple of easy options here. Slice off the entire breast. It is easy once the meat has settled. Dawn: I like some of the leg meat too! This can be cut using a good sharp knife, too. Serve with some of the other amazing recipes on our food blog and remember to follow us on Twitter @Love_Food_UK and here, on the blog, too. 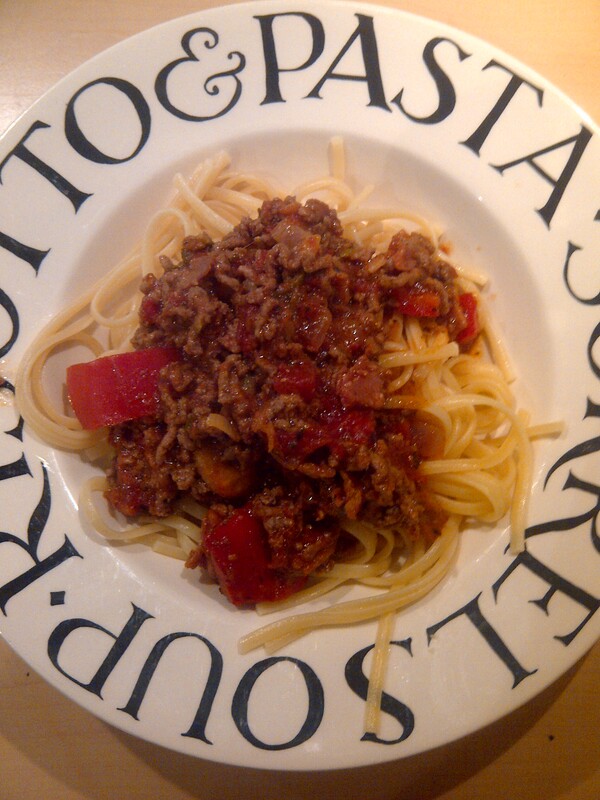 Andrew: Spaghetti Bolognese is a good old student staple, and I have developed this recipe over the years through experimentation and now have something far tastier than the basic mince, onion and tomato concoction that my 18 year old self served up! It is now my youngest daughter’s favourite! It is requested for every birthday and when friends come round to stay. Leftovers can be frozen when cooled. There aren’t leftovers very often. Dawn: That sounds like a great flavoursome meal! Just what this blog is all about! In a wide and deep pan, warm 15ml of olive oil on a low heat. Add grated carrot and courgette and sweat them on the low heat until they start to darken and break down a little. This takes about five minutes. Dawn: Why use these vegetables – don’t you start with onions? Andrew: It gives the sauce its base, bulks it out with vegetables and also adds texture while absorbing the flavours later on. Add the finely chopped bacon to the pan and raise the heat a little to colour the bacon, but don’t crisp it! Flavour and texture again! Add the dried herbs. You don’t need to use all four: I used thyme and basil the last time I did this. About two teaspoons would be sufficient. Allow them to get in contact with the pan, and the flavours will flood your kitchen. Cook for about a minute. Keep them moving so they don’t burn. Dawn: What about those fresh herbs Andrew? If you used them, they would burn? Andrew: That’s right Dawn! Use them later on when you are adding the other vegetables. I prefer some torn basil leaves. If using thyme, pull the leaves from the stalks. Turn up the heat a little more. Add the minced beef to the pan, making sure it is well separated. Keep turning until it browns. Chop the onion; fine if you want a smoother end product, roughly if you prefer a more ‘rustic’ touch. Recently I have been using red onion in preference for the colour and also because of the milder and sweeter flavour. Chop the peppers and mushrooms to your preference too. Add the onion, mixing in well, before adding the peppers and mushrooms. Add the tinned tomatoes and mix in well. If using whole tomatoes chop them in the pan with a spatula or wooden spoon. Use a second tin if you prefer, or wish to add more bulk to the dish. Dawn: Fresh tomatoes would be good too, wouldn’t they? Andrew: They would, but would have to be really ripe. I have done that in Italy where they were really cheap and plentiful. Beautiful, deep red, rich and juicy plum tomatoes. Some people remove the skin by leaving them in freshly boiled water but I don’t always bother with that. Do remove the pips though! Dawn: Sounds lovely! Especially cooking this in the sunshine! Add in a table spoon tomato purée, or if you prefer my guilty pleasure a good dollop of tomato ketchup. Dawn: That doesn’t sound very Italian! Andrew: It isn’t, but ketchup adds a little sweetness to the sauce. If you use purée and take the sauce from the heat too early it can be a little bitter. Add the wine if using it, and a desert spoon of green pesto. Another guilty pleasure, but if you like a strong basil ‘kick’ this will give it. Some people add a stock cube or a dash of Worcestershire sauce here, but I think it would overcomplicate the flavour. Add black pepper to taste, and a little salt. Turn the heat down low; put the lid on the pan and leave to simmer for thirty minutes to an hour. This is the really crucial part of the dish. This will allow the flavours to permeate, for the colours to develop and for the meat to become really tender. When ready to your taste, remove from the heat, and leave to one side to cool while you cook the pasta. Dawn: Can any pasta be used, Andrew? Andrew: Yes, and traditionally a long pasta is used; usually spaghetti, but I prefer linguine, which is flatter and takes a little less time to cook. Tagliatelle is just as good too. Andrew: Either, it is up to you, but I have never found fresh pasta in any Italian supermarket. Dawn: I suppose if you had the time and inclination, you could make your own pasta and it’s worth remembering that there are some really great ones to buy with herbs and add-ins that are simply amazing to eat. Serve with parmesan and plenty of black pepper. Enjoy with a fresh green salad and a nice Chianti! Dawn: Sounds delicious! Room for one more? To keep being feed (get it?) our tasty and inexpensive meal ideas, follow this blog (your information, email, name, etc are secure and not sold to anyone, rest assured), and follow us over on Twitter @Love_Food_UK. See you soon!